Nim lives on a small tropical island with her scientist father, Jack. When Nim was very small, her mother, who was also a scientist, decided that she wanted to investigate the contents of a blue whale's stomach. Unfortunately, something went very wrong and she lost her life. 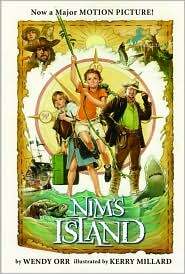 After this tragic loss Jack created a home for himself and Nim on their lovely deserted island. Jack and Nim are very happy together now. They live in a hut which Jack built, and Nim has a wonderful time with her animal playmates, especially Selkie the seal and Fred the marine iguana. One day Jack decides to go on a short scientific expedition. He will only be gone for three days and Nim is very capable of taking care of herself for a few days. At first all goes well and Nim carries on the usual routine; taking care of the garden, getting fresh water, and preparing meals for herself and her chums. Then there is a fierce storm at sea and the rudder of Jack's boat is damaged. It is going to take him longer than expected to get home. As per his request, Nim checks Jack's email every day and one day she sees that Jack has received a message from Alex Rover, a famous adventure writer. Soon Nim and Alex are writing to one another regularly. Alex is an armchair adventurer who never actually goes to any of the places that she writes about. At first she does not realize that Nim is a child who really lives on a tropical island, but when Nim runs into trouble Alex comes to realize the reality of Nim's situation. Perhaps the time has come for her to become more than an armchair adventurer. This is a highly entertaining book for young readers who are ready to sink their teeth into a more challenging piece of writing. Delightful animal characters and an engrossing adventure makes this a title that readers will find hard to put down.